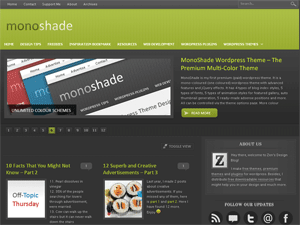 If you have problem while using the theme, free support is available at the MonoShade Support Forum. Fully widgetized sidebar with 6 extra widgets (all items can be arranged at widgets page). Totally controllable featured gallery : time to switch image and auto-run/manual-run. 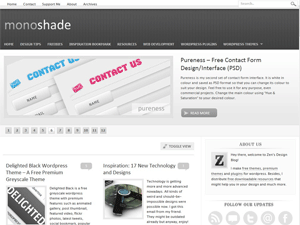 Supports for WordPress Custom Menus, with 2 locations : Above Logo & Below Logo. Category and page navigation bar can be disabled if not needed. You can hide all comment count and comment related area if your site doesn't need comment. OpenGraph feature. Your post will show thumbnail when you share to facebook, digg, etc. Extra Downloads section available for side downloads such as localisation files, colour schemes, etc. Internal Link Building with "More Posts" and "Random Posts"
At the moment, we have 8 colour schemes for this theme, including the default colour scheme. Blue version of monoshade, with blue-ish body background colour. Dark Lime version of monoshade (dark background). Dark Reddish Pink version of monoshade (dark background). Dark Blue version of monoshade (dark background). White Background version of monoshade. Like the default colour but with white background. You need to install flickrRSS plugin to show your flickr photos at footer. 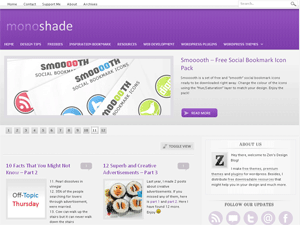 You need to install SexyBookmarks plugin if you choose to use it for social bookmarking. Decide and update "Thumbnail System Priority" , "Post Image System Priority" and "Auto Thumbnail Generation" settings at Theme Options > Post Thumbnail & Post Image Settings. If you are using magazine style, you need to include a manual excerpt for every post so that your blog looks better. You can add excerpt to your post while editing or adding new post. You can, however, leave your excerpt empty and wordpress will automatically make an excerpt for you, but all HTML tags would be auto removed. The custom css file will be loaded after every other stylesheets, so your css can override the default css. You can easily install colour scheme by copy and paste the colour scheme files into monoshade theme folder. After you paste the files, it will be available to choose at the theme options page. More colour schemes can be downloaded at the "Download" section as time goes by. Since version 1.1.6, you can arrange every single thing in the sidebar including about us menu, subscribe to updates menu, adsense and more. Therefore, after installation, please visit the widgets page, add them to the Big Sidebar and arrange them. Please note that all theme widgets (widgets with name that ends with the word "monoshade") are only optimized for Big Sidebars only, not for Small Sidebars. What is Big Sidebar and Small Sidebar? Using Custom Menus, you can add links from categories, pages and virtually any link into a single menu. If you assigned custom menu to any of the location, it will replace the theme's default navigation menu. By default, at most 9 categories were loaded into the navigation bar. This is to avoid overflow if you have too many categories. If you need to display more than 9 categories or control which category to show, you can choose at the theme options page by ticking them. Square Post Thumbnail is a square image of size 125 x 125 pixels, shown at blog index, related posts and search (if enabled). Rectangle Post Thumbnail is a rectangle image of size 290 x 100 pixels (only if you choose "two-column magazine with rectangle thumbnail" at theme options page). To beautify your blog, try to include a post thumbnail for every post. Post Image is a big image of size 550 x 190 pixels, shown at single post/page, just below the post title. Rectangle Post Thumbnail has same ratio as the Post Image so you can use the same image for both. Square Post Thumbnail and Rectangle Post Thumbnail can be auto generated if you enabled "auto thumbnail generation" and left the input empty. (learn more at "All about Auto Thumbnail Generation" below. MonoShade already have its own thumbnail system before WordPress introduces Featured Image system in Wordpress 2.9. To continue support all MonoShade users who were still using the old thumbnail system, we keep the old thumbnail system. After choosing a photo to upload, please wait a moment while wordpress is crunching the photo. When you create/edit a blog post, scroll down to the container called "MonoShade Post Thumbnail & Post Image". Upload your image and paste the direct URL into the input. You don't have to create a custom field yourself because this theme has a built-in area for you to enter the image URL. The first image in your blog post will be cropped and used as thumbnail. If your post does not have an image, it displays a default thumbnail. If the field is left empty, and you did not enable auto thumbnail, it displays a default thumbnail. Of course, the default thumbnail can be changed at theme option page. NOTE: By default, for auto thumbnail generation to work, your post's first image must be hosted in your own website. This is to prevent others from using your server bandwidth. "Your first image must be hosted in your own website"? Why and What does that mean? If the thumbnail generator script can access images from another website, it means anyone can use your server resource to create thumbnails for themselves. To prevent that, the default thumbnail generator script disallow loading image from another website. However, if you don't care about that, you can download the TimThumb (cross site) at the "Extra Download" section so that you can then generate thumbnail using images hosted on another website. It means that if your site is http://mysite.com, the images URL must start with "http://mysite.com/". This illustration explains the difference between the two method. Resize to Fit uses CSS to stretch the image to the desired size. Zoom/Crop to Fit uses TimThumb (thumbnail generator script) to zoom/crop to the desired size. Therefore, if you choose Zoom/Crop to Fit, make sure that your thumbnail image is hosted in your website. Zoom/Crop to Fit is recommended if your thumbnail ratio differs too much from the default thumbnail ratio. First take a look at this Step-by-step guide to activate Featured Gallery. Visit the theme option page, select "Featured" as the Featured Category. Next, assign all featured posts to the "Featured" category. You can also choose to display "Posts from any category" in the featured gallery. You can choose to use built-in ads codes or your custom codes for all 5 positions. If you ticked the checkbox, we will display the ads using our built-in adsense codes. If you want to display your own ads/banner, you can enter your own HTML codes in the textarea, but make sure you untick the checkbox. By default, social bookmark area (Share This Post) shows 6 buttons which include Twitter, Facebook, Digg, Technorati, Delicious and StumbleUpon. Some users might find these 6 buttons are not enough, so we allow user to choose to use a more complete plugin SexyBookmarks for social bookmarking. If you are using SexyBookmarks, please set the "Menu Placement" option to "Manual Mode" in the plugin settings page. Some users reported that WP-PageNavi plugin causes the sidebar and footer to be missing. If you have WP-PageNavi plugin installed, you should deactivate your WP-PageNavi plugin. A POT template file is included with the theme inside /languages/ folder. With softwares like PoEdit, you can open the POT file and translate the theme into your language. When you're done with the translation, save the mo/po files inside /languages/ folder. Fixed a bug in categories navigation bar. You can now show all categories correctly by ticking "ALL CATEGORIES" in the Navigation Control setting. About Us widget - you can now use text as widget title. If you are using different colourscheme, please download the updated colourscheme zip file get the new "aboutus_bg_top_notitle.gif". Added support for WordPress 2.9 Featured Image System. Added support for WordPress 3.0 Custom Menus, for 2 locations (Above Logo & Below Logo). If you assigned a custom menu to any location, it will replace the theme's default navigation menu. User can now choose to hide post image in featured gallery only or single page only, or both. Opengraph added on single post and page. Your post will now show thumbnail when sharing to facebook , digg, etc. Added 404.php for "Page not found" message. The widgets and theme options page is more clean and organised now. 3 new images added for both blue and red colour schemes. If you follow the changeset, it should cover that. For better view, you can now toggle the block of options at theme options page. At theme options page, a submit button is added at the bottom of each block of options. Auto thumbnail (original version) now displays a default image if your first image is hosted on other sites. You can now hide post image (if any) in their own page/post by creating a custom field of name "hidepostimage" and give it a value of "1". Fixed "new version notification" problem due to the famous cross-site ajax problem. Changed the method to determine new version. Added version checker at theme options page (it notifies you when new version is released). You can hide the notification at theme option page. Whole new jQuery gallery with 5 animation styles, you can control time to switch image and disable auto run. You can now choose to use built-in ads codes or custom codes (your banner codes) in all 5 google ads positions. A minor display bug fixed. Category and Search page now follow your "Blog Index Style" setting. Changed Files : Almost all files due to localisation. Style.css Changes : Not much, you can download the list of changes at "Download" section. For normal purchase, this theme costs only $15. You are allowed to remove the "designed by zenverse" by paying an extra $5.